Formed in Neuchâtel, Switzerland in 2005, comes November-7 – a female fronted alternative metal band known for combining melodic and industrial elements. Since the band's formation, they have released two EPs, two live efforts and now are back with the follow up to 2011's debut album Season 3 – a concept album entitled Awaraxid 7mg. The concept behind the title is a drug to cure us of our dull state of adulthood, and return us to our childhood state when we had our own dreams and ambitions, before being corrupted by the world around us. With many reviews popping up comparing the band to Lacuna Coil, it is hard not to dismiss the comparison between the bands. While November-7's bass lines do remind me of Karmacode-era Lacuna Coil in places, the formers are more catchy to the ear and are better structured. Both Cristina Scabbia, and Annamaria Cozza have low voices with dark sultry tones but that is as far as the comparison really goes. In a few of Lacuna Coil's latest studio releases Cristina's voice has often sounded nasally or robotic, whereas Annamaria's voice has been consistent through November-7's back catalogue. Annamaria's voice strikes with more emphasis, laced with the thick tones of her accent. For me, it's her voice colour which gives a unique flair to her voice. The album opens with the stomping Tug Of War, pulling every punch as it soars into the chorus. 'Let's play the tug of war to see who's strong' always, always get stuck in my head, and the themes of internal conflict are very well put across in Annamaria's strong vocals. Plunging into Acid Life, and Black Veil the band take it down a notch. While both songs differ from one another they both build on the idea that our constrictions set by society on both emotional and psychological levels are damaging medically. An opinion which I completely agree with. Acid Life's possesses a taunting edge in the vocal lines which gives me a vague sense of the hebejebes that continues on in to Black Veil. The band's lead single Another Day shows a more melodic, softer side to the band whilst staying very upbeat with the electronic elements. While being insanely catchy and always getting stuck in my head, it also strikes a chord with me. November-7 presented the track along with a music video that brings together the effects of the drug, and how it takes it's toll on a couple, where – and spoiler alert – one of them sadly ends their life. The more that I listen to the album, the more I feel connected to the album. As someone who has a severe mental illness I feel that many themes running through the album apply to my life. My personal favourite from the album has to be Alive?, which is something of a rock ballad. It's emotive and just sticks with me. The follow up Pieces Of Me sounds like it'd be a potential contender for a second single, it strikes the perfect balance of everything that November-7 encompases. Coming towards the end of the journey we have Your Turn, which musically is fantastic. However, I find myself cringing a little inwardly at some of the lyrics. There's also something beautiful about the electronics here that I can't quite put my finger on. Awaraxid 7mg comes to a close with Black And White, a beautiful ballad. While the album comes to a halt here it leaves many questions unanswered, most likely on purpose. I like to think that the message we should take away from this album is to think for ourselves. 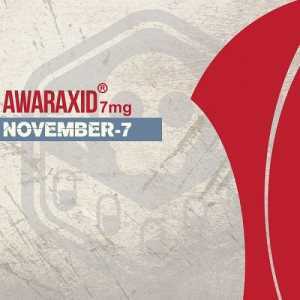 After listening to Awaraxid 7mg, I feel like November-7 are heading in a similar direction to that of Lacuna Coil, but more inspired, heavier. With an album combining sounds similar to Lacuna Coil's dark tones with bouncy electronics on the solid foundation of an industrial influenced metal band. A solid album, and while I prefer the band's debut album at present, I can feel this album growing on me with each play and probably becoming my firm favourite in the future. I see a bright future ahead for the band and look forward to what is to come.